About a year ago I made this stick family after watching this G+ hangout on 10 Stick Crafting Ideas. As you can see there were seven original family members. Some of the googly eyes fell off, but in general they’ve held up quite well after a year of play. But a few weeks ago I decided it would be fun to give our stick family some neighbours. We could have a whole community! So I set up some sticks from our backyard, various fabric scraps, googly eyes in a few sizes, a couple of balls of wool, scissors, glue (which I’d poured into a paper cup for easier access) and an old paint brush. And then I asked JJ if she wanted to help. Do ya reckon she’s keen? Lol. They are fairly simple to make. JJ and I have slightly differing techniques, but they both yield similar results. Here’s how JJ makes them. JJ cut a small amount of scrap fabric (very carefully, using grown up scissors). Then she painted glue onto the back of the googly eyes and stuck them on. She painted glue onto the top of the stick and carefully wound some wool around for hair. 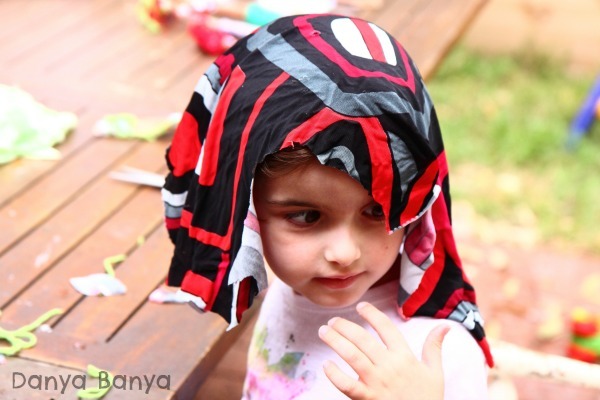 She painted the back of the fabric and wrapped it around the middle of the stick for clothes. And finally she painted some glue onto the stick and added a small piece of wool for a smile. JJ made loads of them. She pretended that she was a real toy maker in a factory, or perhaps an elf in Santa’s workshop (and suggested this is what she might be when she grows up). She personifying each doll as she went, making them slightly different to the one before. I was really surprised at how this project captured her attention. She stayed crafting for well over an hour. And not to be left out, Bee got into the crafting action once she’d woken from her nap. We skipped the googly eyes as they are too fiddly for her at the moment. 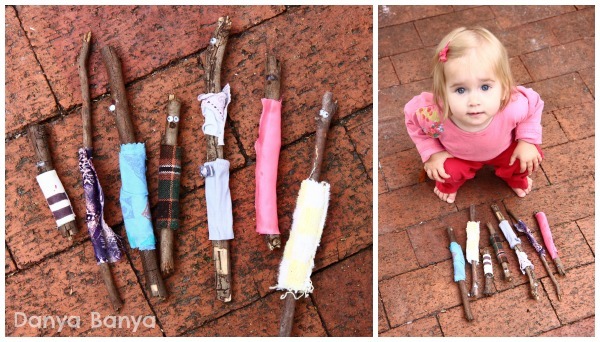 But she was able to stick a few pieces of fabric onto her stick with very little help. It was Bee’s idea to hold up her stick afterwards and pose for a photo. Isn’t that adorable! She’s seen JJ pose with her creations before, so evidently Bee was proud of what she’d made and thought it was photo-worthy! Here is the whole community, waiting for the glue to dry. As you can see, the original stick family have all been to the salon and are now sporting new hair cuts! Oh, and the optometrist has fixed their eyes where appropriate too. And now they have lots of friendly neighbours to go on play dates with (and perhaps even have a much coveted sleep-over). Well, firstly, making things with fiddly pieces like googly eyes and cutting things with scissors both work on fine motor skills. 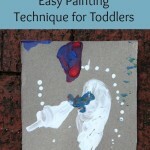 They develop hand eye coordination, and work the small muscles in the fingers and hand that will be needed for writing later on. JJ was also able to express her creativity in making her stick people. Each one is unique. 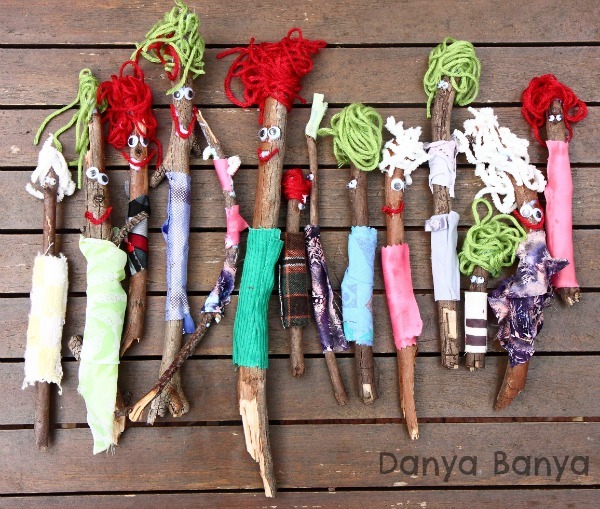 There are variations in hair colour and design, colour and shape fabric for clothes, facial expressions (including using natural features of the sticks for noses in some cases). 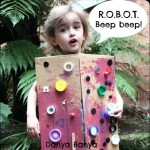 She gets to play with them twice – once in the process of making them, and then again as part of her regular doll play. Since they are made from mostly natural or upcycled material (all the fabrics were upcycled), they are good for the environment. 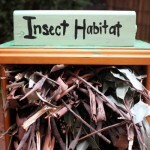 As our stick people were made from things we already had on hand, they are effectively free. We can add more neighbours to the community whenever we want to! I think they are way cooler than cookie-cutter store-bought dolls. Don’t you? Have you made stick people yet? And do you upcycle your underwear? 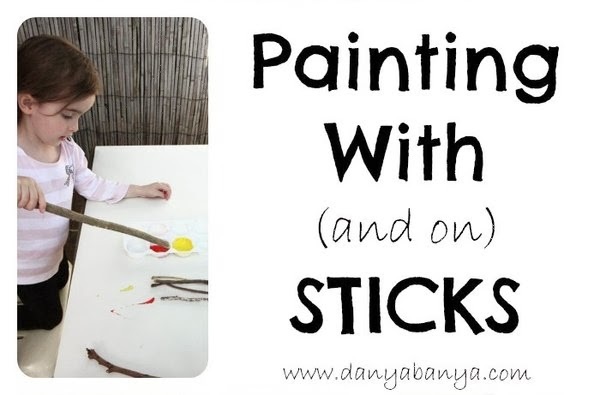 For more stick play, you might also like Painting With (and On) Sticks. 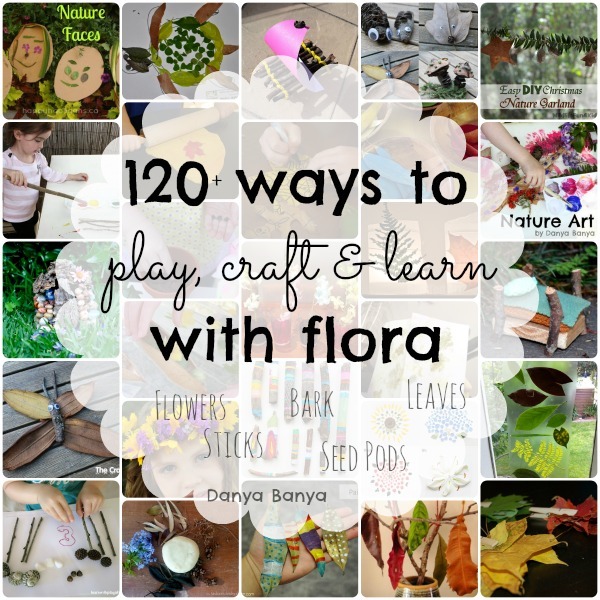 Or for more nature craft ideas, here’s over 120 Ways to Play, Craft & Learn with Flora. 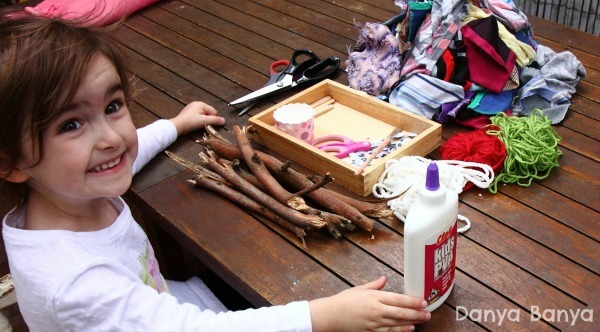 I like all your point as to WHY as well, so much to gain developmental for children to do cool activities like this. Pinecone people would look cool! 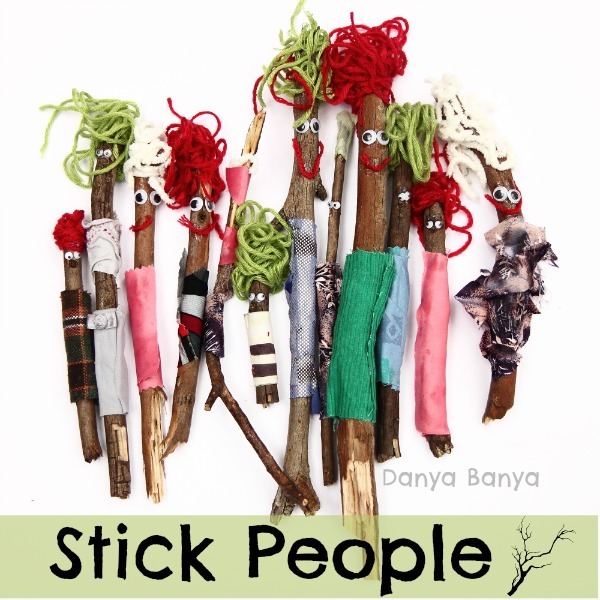 I love these cute little stick people…what a fantastic, whimsical idea! Stopping by from Hip Homeschool Moms! Love these! 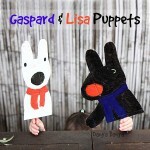 You should visit our website and add them to our bloghop! Great idea. 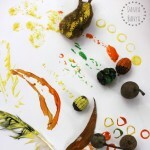 I love the way each kid can enjoy the activity at their own level, and its a great use of natural products. Thank you. These are some of the reasons why I love this activity as well. Love, love, love these so much! I'm sure you already have a copy of the brilliant book Stickman by Julia Donaldson. Off to share this on FB & Twitter. My recent post Cookies on the fire. My 3 y.o just saw this and said 'let's do this!' 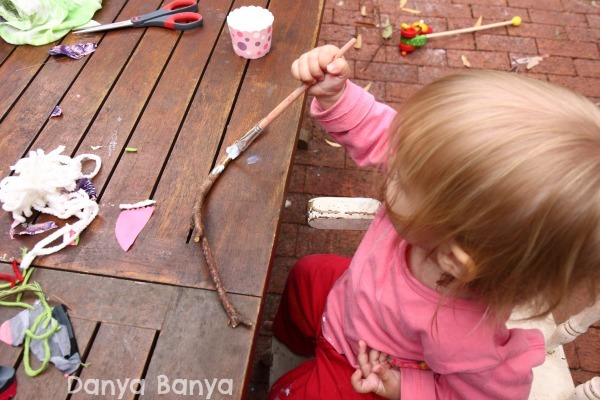 So we made one stick man… Stick monster actually, since he insisted on sticking one eye below the other !